He came back to kill a tyrant. He found the Devil instead. An amazing historical novel with a supernatural twist set after the English Civil War. This is the stunning debut from Clifford Beal. Clifford Beal, originally from Providence, Rhode Island, worked for 20 years as an international journalist and is the former editor-in-chief of Jane’s Defence Weekly in London. He is the author of Quelch’s Gold (Praeger Books 2007), the true story of a little-known but remarkable early 18th century Anglo-American pirate. But he’s also been scribbling fiction from an early age: his seventh grade English teacher nicknamed him “Edgar Allen” undoubtedly due to the gothic subject matter of his extremely short stories. For recreation, Clifford used to don plate armour and bash the tar out of people in the Society for Creative Anachronism before moving to more civilised pursuits such as 17th century rapier and dagger fighting and motorcycling (though not simultaneously). Today, he is more likely to be found at the seaside or the Savile Club in London, sharing good wine and conversation in a place where the sparring is usually only verbal. 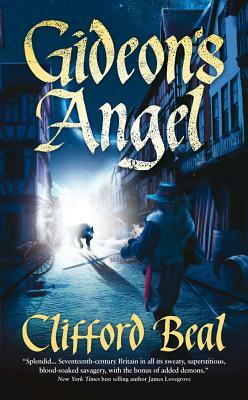 Gideon’s Angel is his first published novel. “The motivations of these not-quite-heroes and the people they come up against are deliciously human and it’s nice to see this sort of occult historical horror in which everyone’s actions seem at the very least justified,rather than being motivated through insanity….It is a good read and very entertaining, and recommended for fans of both horror and Roundheads."